Maybe you have a high chair cushion already and it’s just old and tatty with it having seen better days, but you do not like the idea of getting a whole new chair for what could be the simple replacement of the cushion. Well, this is a great move forward in saving money, getting your baby back on track to feeling comfy, in a hygienic space and all at the same time setting a good example of why you’re a good mom. Size – Sometimes you can get a pad that’s too big for your chair and it ends up squishing up and folding back on your child. 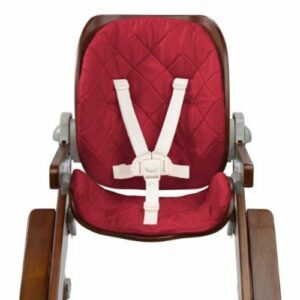 Chair attachment points – Some have straps and clips that tie around the back of the chair and making sure you know what chair you intend to use will make for no unwanted returns. Brand specific – Certain brands have replaceable pads and are very convenient, while some don’t. There are some generic types of pads that seem to be really viable and can be used throughout most range and types. Test the Fit – Make sure to test the pad once it’s on them to see how your baby looks and if they seem cramped then maybe it’s time to think of returns. Find Quality over Price – Sometimes quality lasts the test of time and can save both time and money. For example – if it’s water-resistant you might find over the long run it lasts and those other types of soft-looking pads that soak up everything under the sun and isn’t washable makes for a quick-wearing and loses its durability and hygiene. Padded is Best – Softer the better, it’s that simple and your child will thank you loads. Water Proof – This doesn’t need explaining, simply the fact it’s a feeding pad means it’s gonna get soaked and dirty so if water-proof the better. Material – Cotton soaks uploads and if there isn’t a coating of synthetic material covering the top layer then ideally be careful, but most designs have taken this into account and all do in this review. Below I have put together a review of the top high chair cushioned pads for babies on the market, that I think caters for all the possible situations that a parent might face when making a decision about choice. Like most of the reviewed pads here I am only choosing some of the best, either in quality, price or a mix of both and this pad for me is a mix of both. The photo displayed on my left shows that this can attach to almost any other chair (exceptions out there of course) and means birthday parties are fine, grandma’s, and all the places like restaurants too, which is essential for the mum on the move who doesn’t want to slow down just yet. The simple design is even simpler to assemble and won’t be one of these really awkward pads that get’s annoying and hard to assemble as the clips start to wear, which is why this comes recommended. I had a friend whose child was struggling to get in, let alone clip-in, so I recommended this cushioned pad and how it could be the only one needed instead of getting other pads for each individual purpose (car, travel, eating out etc), which might allow the pair to get on with less struggle and thankfully they did. This pad comes with an awesome 5-point harness and keeps them secure, snug and away from the likely toppling-over of dishes and whatever else they love to get there hands on, which as parents we know makes a difference. This Bentwood’s pad is another easy to attach and remove cushion with loads of comfort and support. The simple but guaranteed design will fit every time and ensure the meal times are secure, safe and effortless. I love the fact that you can wipe this, wash this and make sure the highest standard of hygiene is maintained. There are loads of comments and reviews suggesting some babies are having to sit on bunched-up fabric once washed, which had deformed inside, but through extensive research and filtering through I am confident this isn’t one to worry about. There is a load of different styles of color and whatever your decor is there is one to fit and keep the ambiance intact because red isn’t everyone’s idea of nice. This infant pad is only compatible with Bentwood’s and shouldn’t be used in conjunction with others, although some people have been able to it’s still not worth the gamble. The dimensions are 15.7 inches by 8.7 x 2.5 for those who think it might ft perfectly. This is another fantastic one and its simple design is one that I would of preferred for my children at that age, although it is a little more expensive than the previous this USA made the product is made to last the test of time. This pad is tall at 18 inches and has been known to fit onto rocking chairs and other chair-like devices. The simple tie-knots that secure to the seat means it is versatile and can be used elsewhere, even taken away for weekends at the extended families. The Bottom pad is 13 inches and 12 inches deep, which is important to know if your baby high chair is a specific size and won’t fit this cushion. I love the fact this baby is made in the USA, it highlights that we can make really good quality and although in recent times there has been a focus on us producing these kinds of products there seems to be a change in tide, which is fantastic! This is great and if you have a need for a chair and want a cushion as well then this comes highly recommended, but if not then the pad itself is great on its own and will keep that baby’s bum comfy and snug. 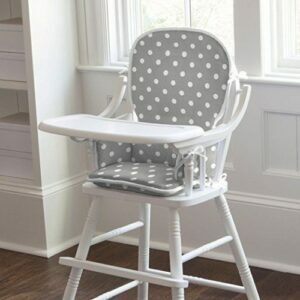 For me the best is the one that is most compatible, easy to use and affordable, therefore the one I have to choose is the “Multi-Purpose Baby’s High Chair Pad”, which is so versatile that no matter your child’s needs, no matter the place, situation and bank balance this will be a friend for both you and your little one. A two-time winner and the best baby pad is as you guessed “Multi-Purpose Baby’s High Chair Pad”, which for me is not only the cheapest in the range but also a great pad which ensures all the reasons mentioned above, but also it is comfy, safely secure and offers loads of ways to keep you both on the move and ready for any eventuality.